April 13, 2012, was a day my wife Jennifer and I will never forget. We already had two beautiful healthy children, one boy and one girl, and we were headed to find out how the balance of power would shift in the household. Jennifer was 19 weeks pregnant. The ultrasound technician came in and started the ultrasound and declared quickly that we were having another boy! We were all excited, but Jennifer stayed fixated on the ultrasound screen. She noticed that the technician was spending extra time on our baby’s spinal column. About 10 minutes went by and Dr. Weiler came into the room with a completely different look on her face than she did with our other two. “Hi guys, there are findings on the ultrasound that we need to discuss,” she started. Our worry increased. “There is an area in his spinal column that is not fully developed, which indicates...” “Spina Bifida,” I interrupted. “Yes,” Dr. Weiler answered. Spina Bifida is a birth defect of varying degree to the spinal column. Based on the ultrasound, it showed that some of his spinal cord was actually protruding out of the spinal column, indicating a severe form. I had a better understanding of this than Jennifer, but it didn’t matter in that moment, we both knew our lives had just changed course. Dr. Weiler continued to explain that she would be referring us to Indy for delivery by a specialist and our baby boy would be carted right over to Riley Hospital for Children within moments being born. And there it was, our first connection to Riley. We were initially stricken with sadness, but quickly realized we were going to be just fine. God was blessing us with this opportunity. We felt honored that He had enough faith in us to be responsible for this new life. In the four months between finding out and the birth of Elijah, we met our team: Dr. Golikowski who would deliver and Dr. Fulkerson, the neurosurgeon that would intervene within the first 24 hours. We felt as ready as we could. On August 28, 2012, Elijah Nicholas Taylor was born. He was delivered by cesarean section, placed immediately into a sterile plastic bag and met by a NICU team to stabilize him. By the time Jennifer was stable, Elijah was shipped off through an underground tunnel to Riley NICU. 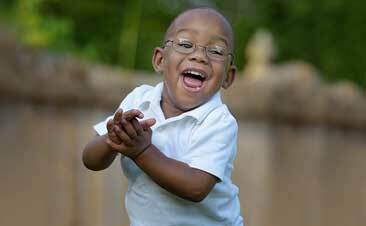 Over the course of 10 days, Elijah underwent two surgeries, one to close the hole in his back and a second to place a shunt in his head to reduce the hydrocephalus that comes with 90% of kiddos with his severity of spina bifida (myelomeningocele). The Riley NICU doctors and team were incredible. We were informed every step of the way. We learned that we would have to watch for shunt failures and that his condition affected his bowel and bladder, so he would have to be catheterized multiple times per day. Walking was questionable due to the level of the defect, but we had faith. Our faith and the incredible skill and expertise at Riley Hospital is what got us through this emotional roller coaster and gave us the capacity to be the parents Eli deserved. Fast forward a couple of years and our story had gotten out in the community and I was invited to join the Bloomington Leadership Committee for Riley Children’s Foundation. I was honored. I knew that I wasn’t going to be a huge financial asset to the group at this point in my life, but I was hopeful our story could help motivate others to understand the importance of Riley Children’s Foundation. In the two years I’ve now served on the committee and I have found an opportunity blend my passions: My son and Riley, and commitment to a healthy lifestyle. 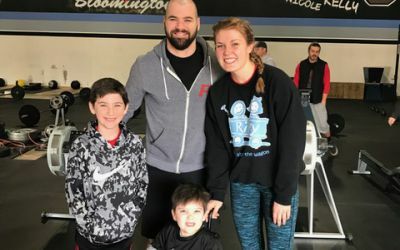 Mallory Daunhauer, a peer member at Crossfit Bloomington, set up a workout to support RCF: WOD (Workout of the Day) for the Kids. It’s a platform to promote wellness and raise funds for Riley. I love that this exciting event gives the community aspect of Crossfit a chance shine. It’s an honor to give it my all for Eli and raise some money for this great cause. Ryan Taylor works as a physical therapist. He and his wife Jennifer (a former teacher who now stays home with their children) are the parents of Gabriel, Isabelle and Elijah. The Taylor family lives in Bloomington, Ind., and are grateful for the community support they receive through family, friends, and church.